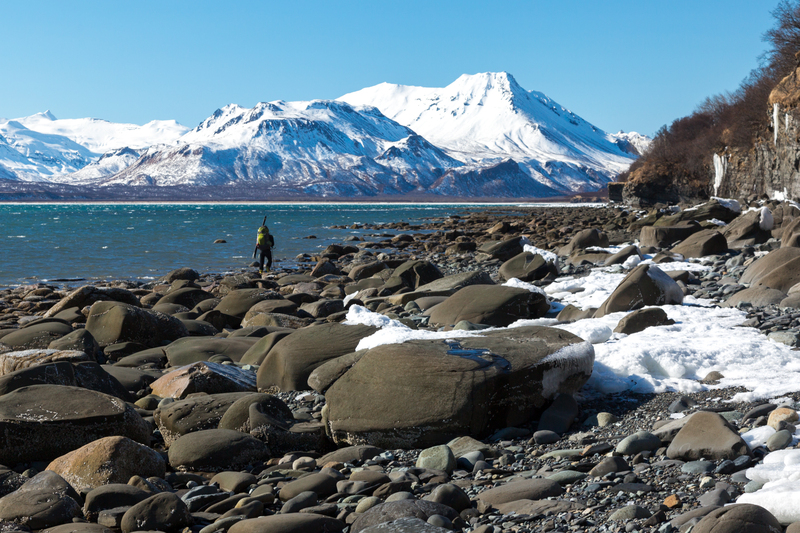 Katmai is a huge and remote National Park in southwest Alaska, best known for bears and volcanoes. The 1912 Novarupta eruption was heard as far as Juneau, and cooled global temperatures by 2 ºF for a year (due to ash particles in the upper atmosphere). 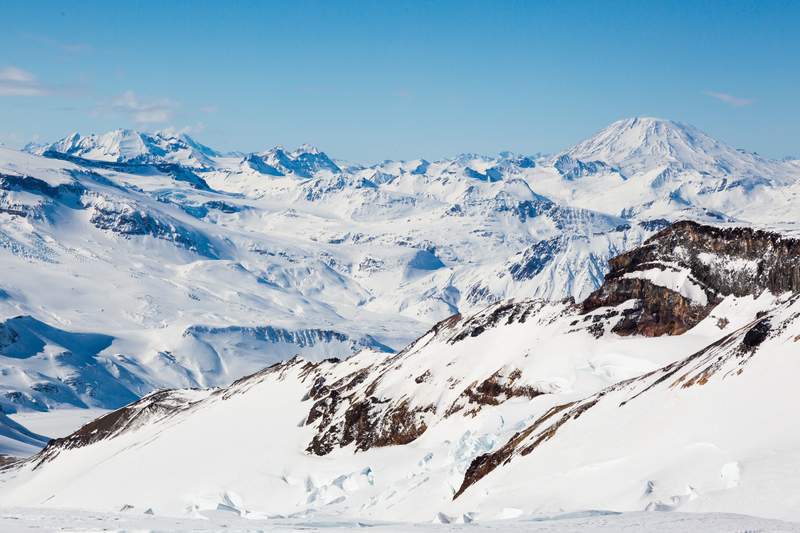 I like to give bears a wide margin, so I’ve been scheming on a winter trip to Katmai. I ran the idea by Josh Mumm, and he was the most committed I’ve ever seen. 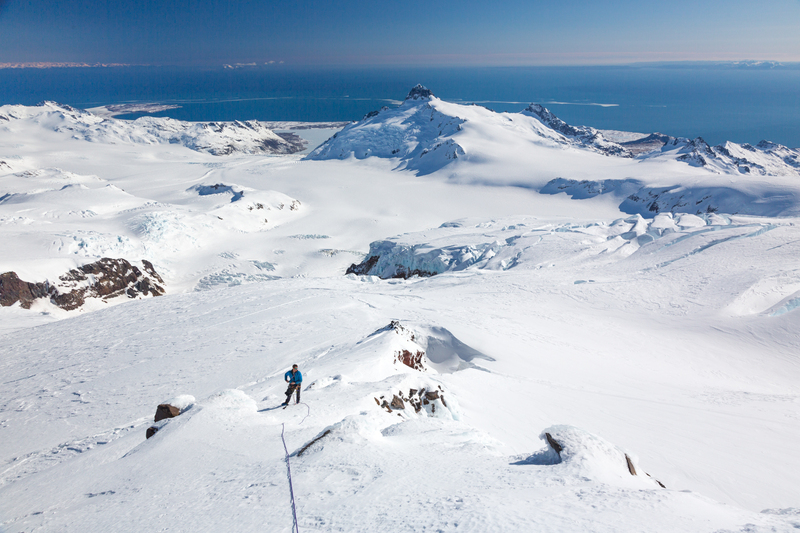 Josh’s motivation was largely because he can see Katmai’s two northernmost volcanoes, Mt. Douglas and Fourpeaked Mountain, from his home in Homer. 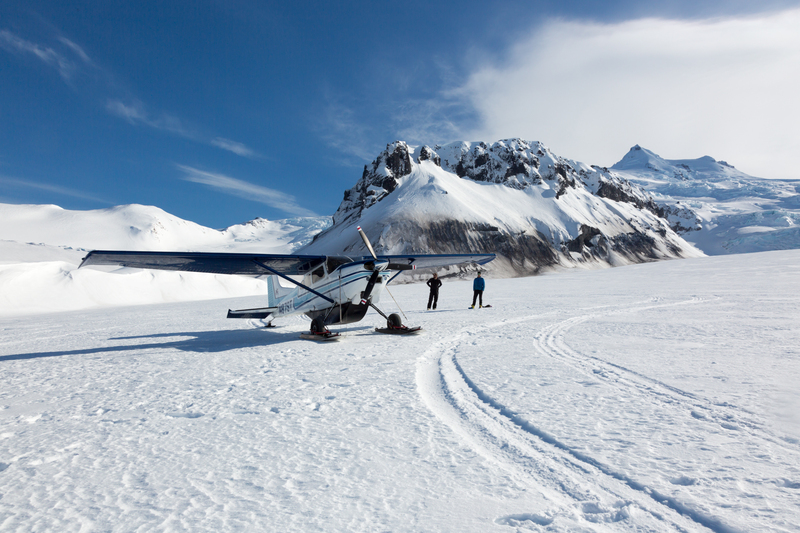 We flew with Chris Klostertman, a friend who runs Trygg Air out of Anchorage and King Salmon. 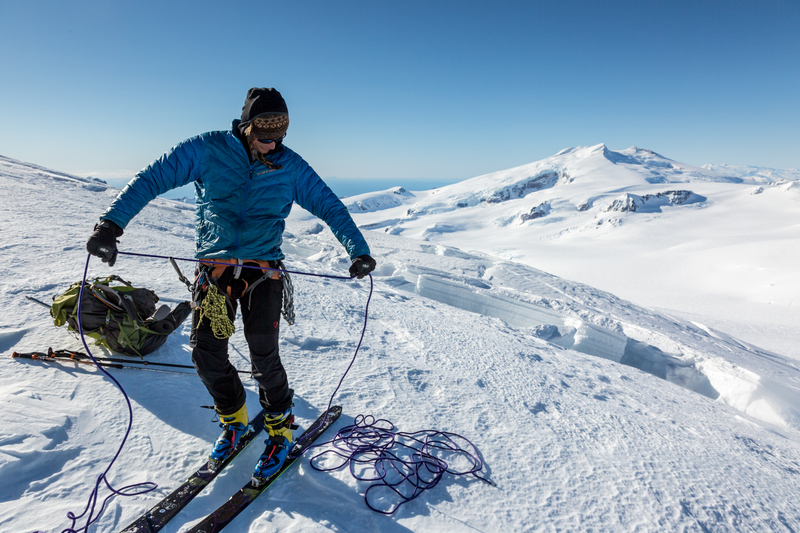 We had hoped to land on Kamishak Bay beach, but the beach was too rough for Chris’ wheel skis, so he dropped us on the lowest glacier lobe below Douglas, 4 or 5 miles from the shore. We could see Augustine and Iliamna smoking behind us, with Douglas and Fourpeaked ahead. 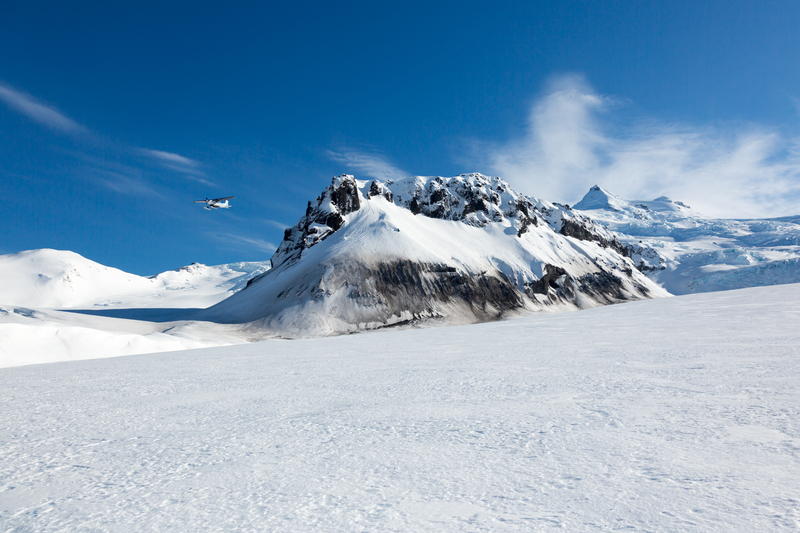 Studying the aerial imagery, we were impressed with how cracked up the glaciers looked. For a better safety margin, we wanted a third partner (one guy falls into the crack, one guy anchors the fall, a third guy is free to set up an independent anchor, etc.). 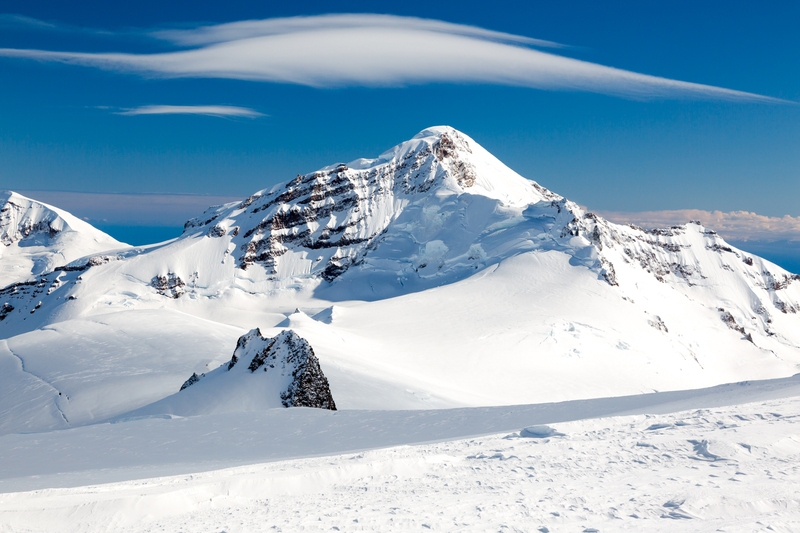 We had Eli Potter lined up, fresh from guiding in Antarctica, but Eli was diagnosed with strep throat the morning of our flight and had to bail. 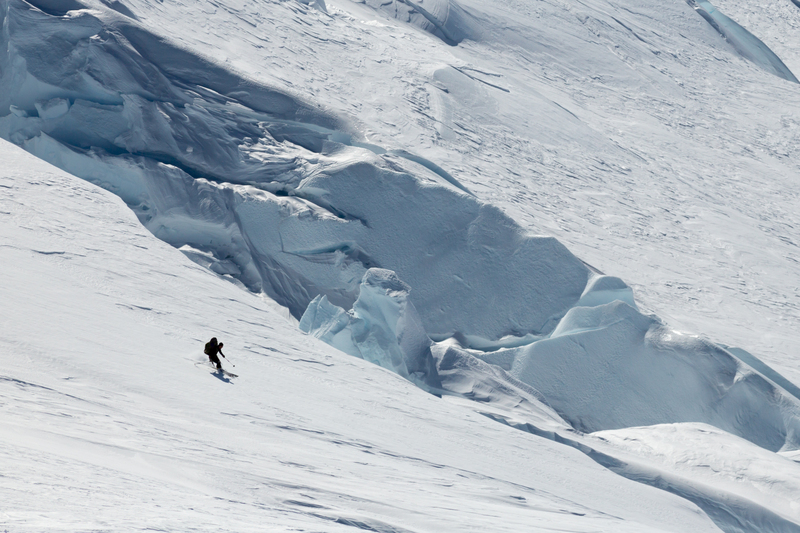 Fortunately, the crevasse bridges turned out to be very solid. 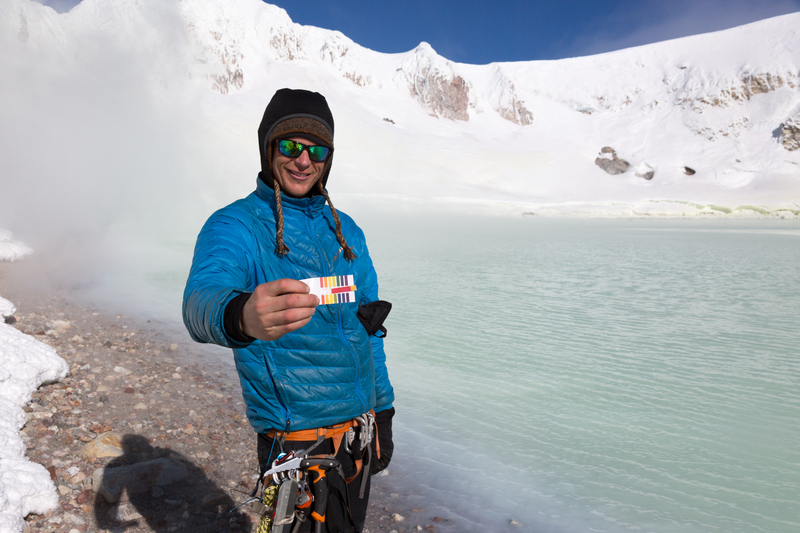 I had heard that Douglas’ caldera lake was highly acidic, so I brought litmus paper. It was pH 1, which places it somewhere between battery acid (0) and lemon juice or vinegar (2). We explored the bubbling water, hot steam vents, and enjoyed warming our feet on the bare rock. Half the lake had a sheen of ice, and we had ice skates, but the potential plunge into acid wasn’t worth the risk. 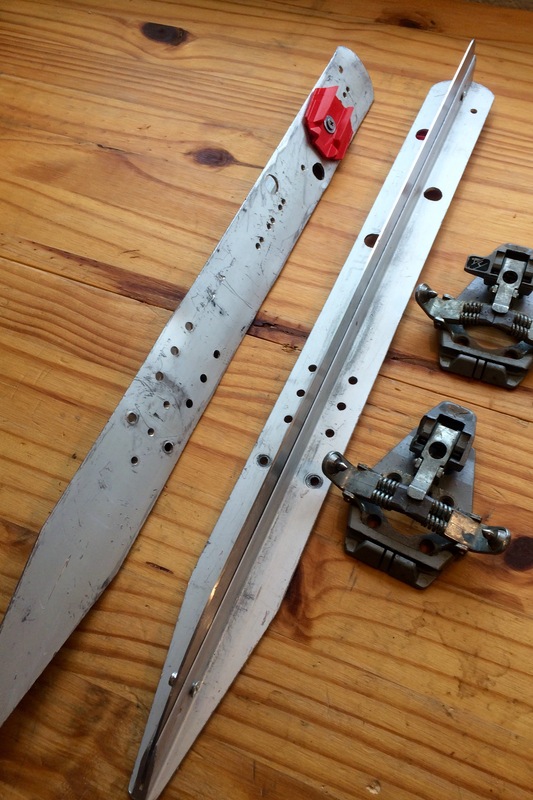 The skates were “skickets,” modified nordic ice skates without bindings. They worked great as snow pickets (anchors). 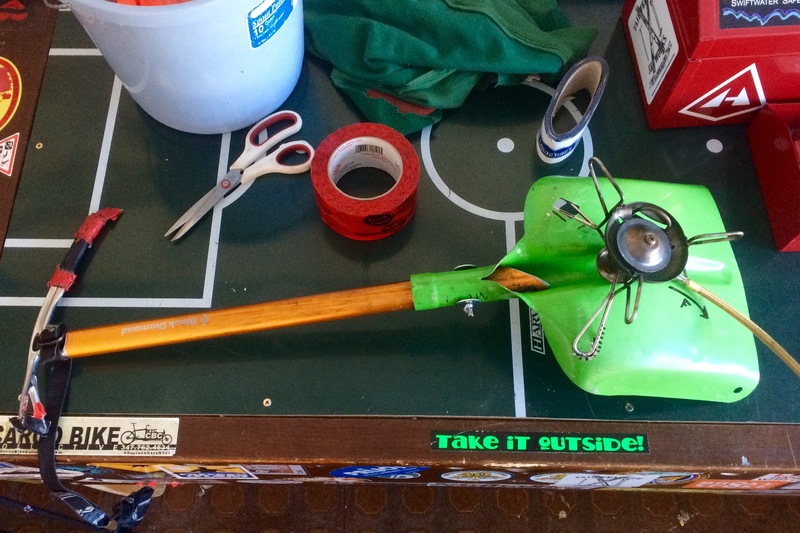 Our other modified equipment was an ice axe handle for shovel blade, and shovel blade drilled with holes that fit our stove, serving as a stove board. 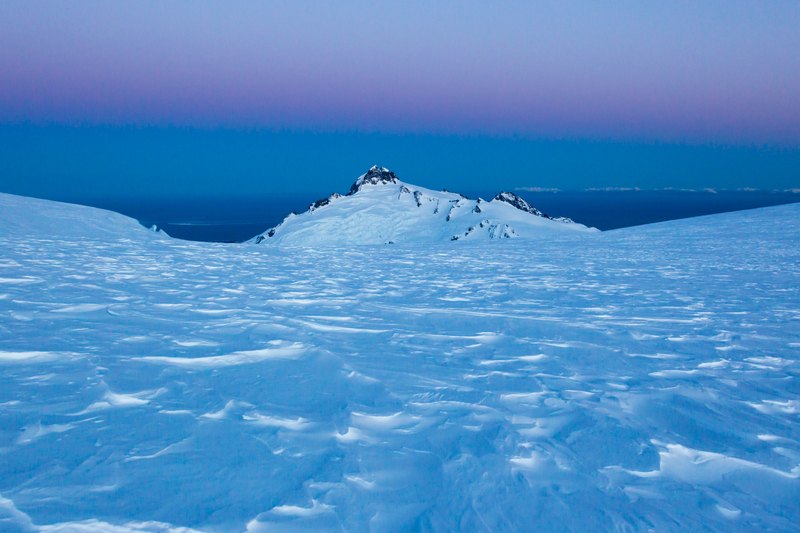 We spent a scenic night on the bench between Douglas and Fourpeaked, and climbed Fourpeaked the next day. 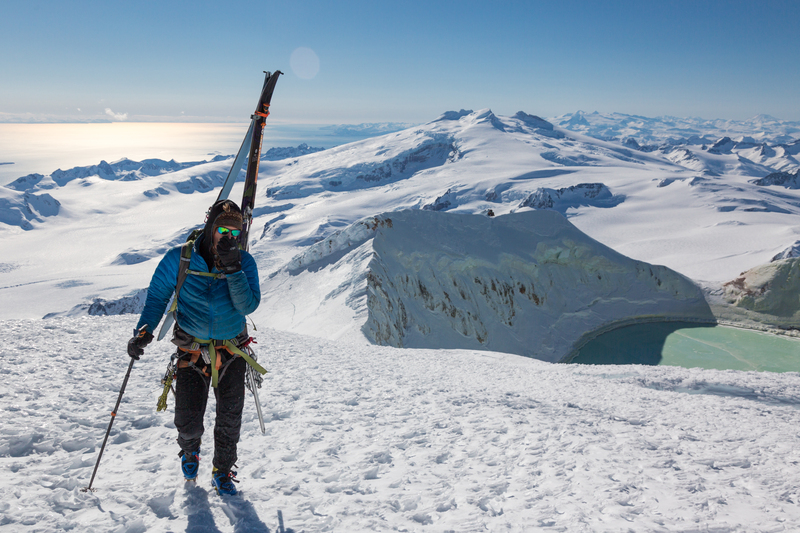 It took a few attempts to find the right route to the summit, the crux was a belayed step across a nasty downward-widening crack. But like the rest of the wind-hammered snow, the snow bridge showed no hint of collapsing. 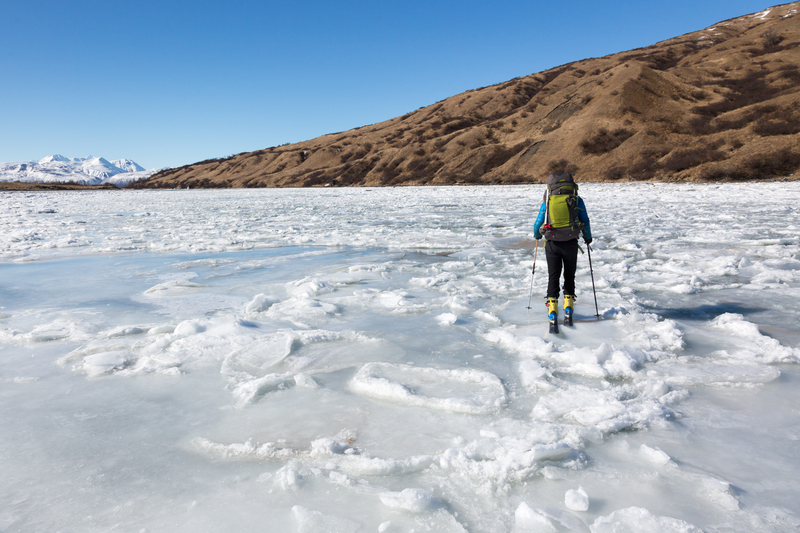 From the Fourpeaked summit (6,903 ft.), we weaved through an ice fall and down to Swikwhak River, where bare ice and a tailwind propelled us to the beach by midnight. In the morning we waited for low tide by exploring the fishery remains, a few old vehicles and foundations. 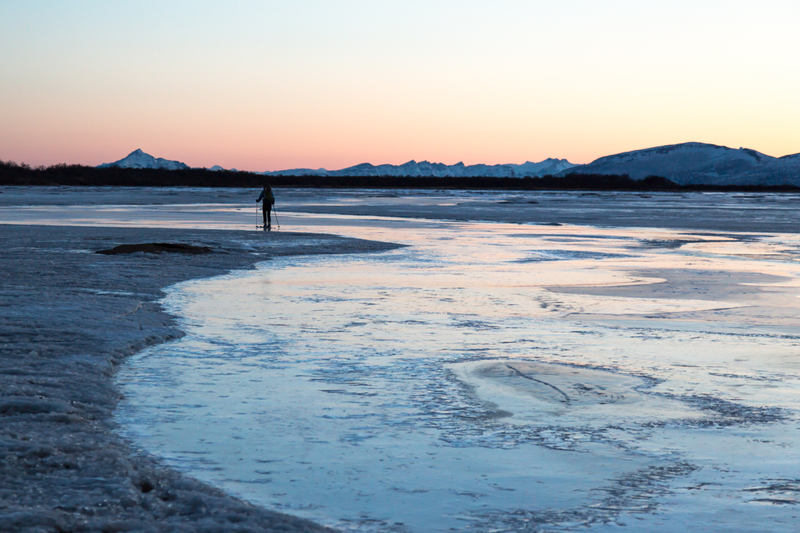 At low tide we hiked back up the lagoon, anticipating 3 miles of backtrack to cross the river, but after a mile or so Josh pieced together a sketchy crossing over dammed river ice. I broke through to my knees on the far side of the crossing, but it was otherwise a success. At low tide we walked the beach to Big River, where Chris had dropped our food cache after our in-flight. The beach travel was a stark contrast from the wind-hammered snow and cold nights on the volcanoes. 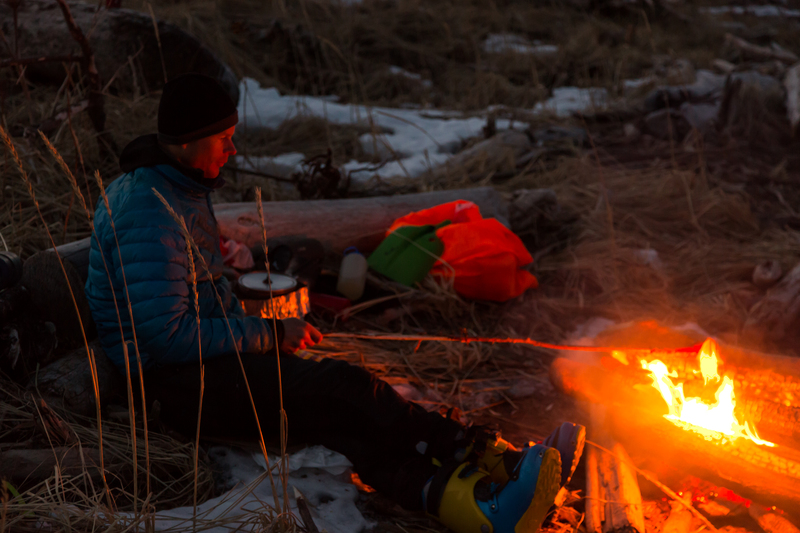 We were several days ahead of schedule, so we built a beach fire and ate as much of our extra food as we could stomach. Josh had a 12-pack of sausages in the cache, I ate 5. Even so, I finished the trip down 10 pounds. It was hard to leave the coast, especially because our packs now weighed 80 lbs and the brush and lack of snow made for slow progress. Even so, we made it Kaguyak Crater for the night. The crater was huge, 1.5 miles across. The crater turned out to be a cold air trap, probably our coldest night of the trip. Josh explored the crater island while I set up camp. Back at camp he told me he nearly lost a ski. 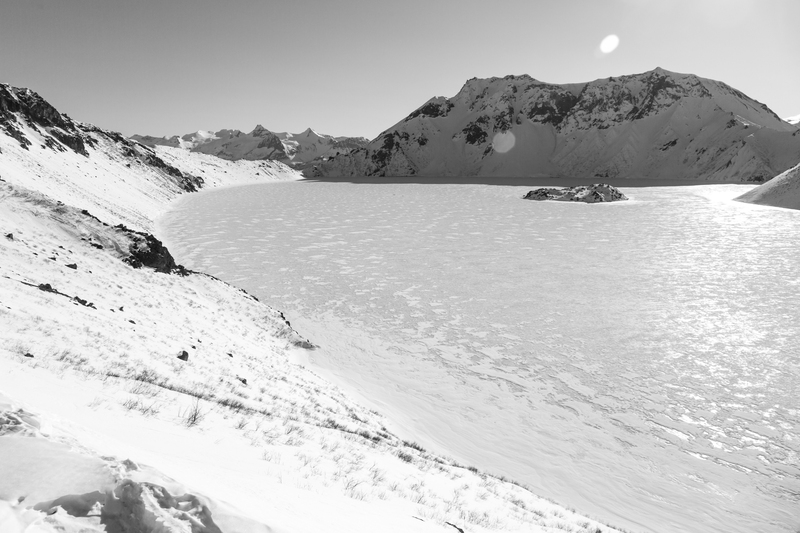 There were only a few patches of open water on the edges of the lake and island, but his ski popped off and was flying toward an opening. Luckily, the ski got stuck in a warm vent (dry) before reaching the open water. 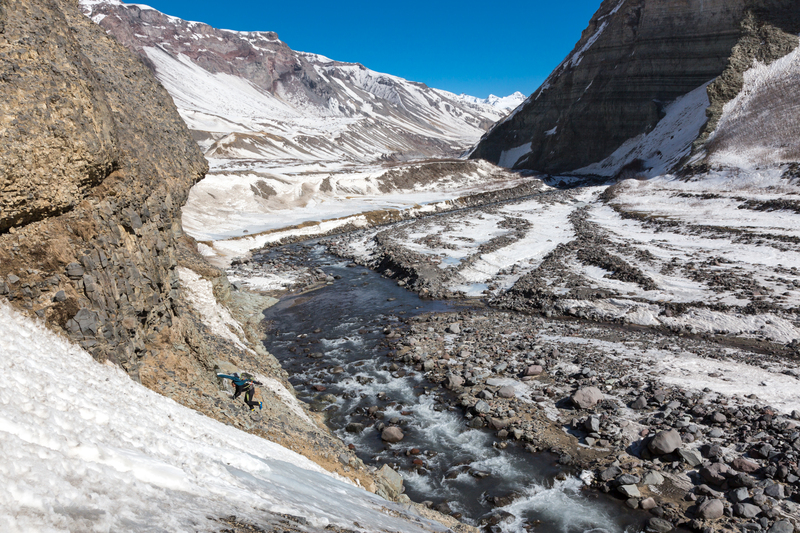 From Kaguyak we navigated a confusing drainage system of incised basalt to reach the next massif of ice and volcanoes: Devil’s Desk, Kukak, Steller, Denison. 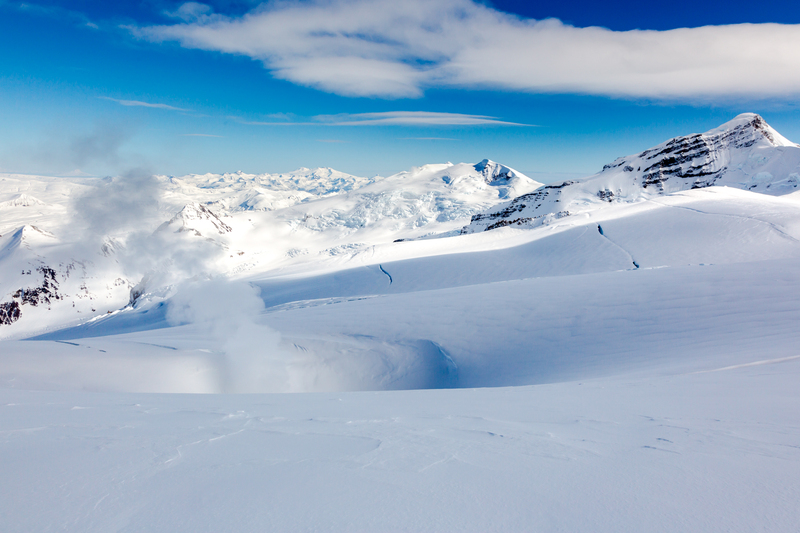 Kukak had several large steam vents, and Denison had two small vents. 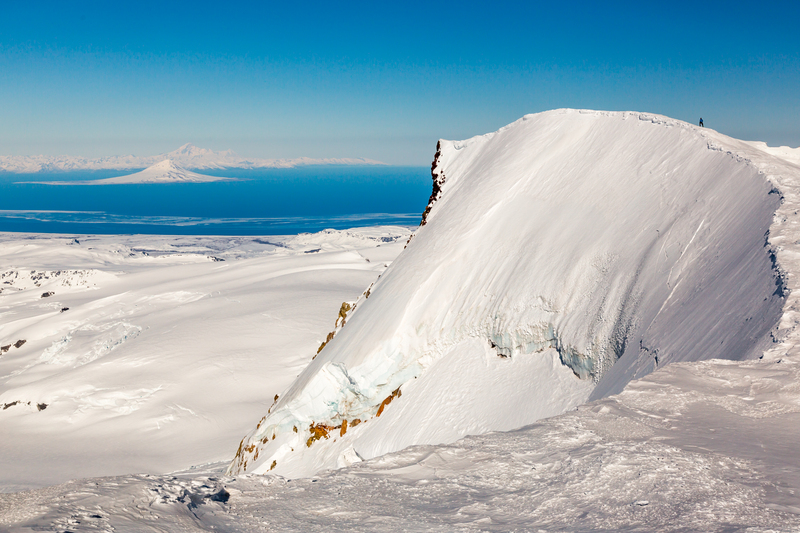 We weaved through the ice falls and were rewarded with a view of the next volcanoes: Snowy, Katmai, and Griggs. 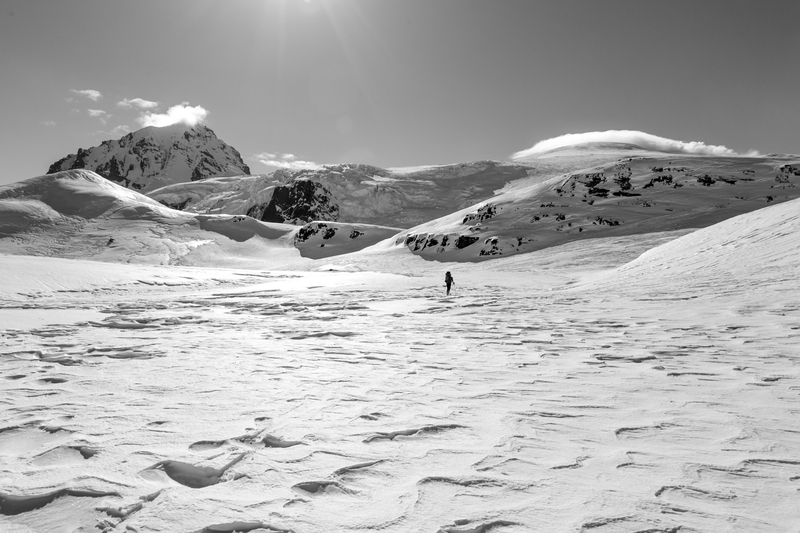 Our intended route to Katmai had several steep sections, and after struggling to hold our edges on steep windboard snow, sastrugi, and ice, we opted for a valley descent to Katmai Lakes, through Katmai River Canyon and then up to Katmai Pass. 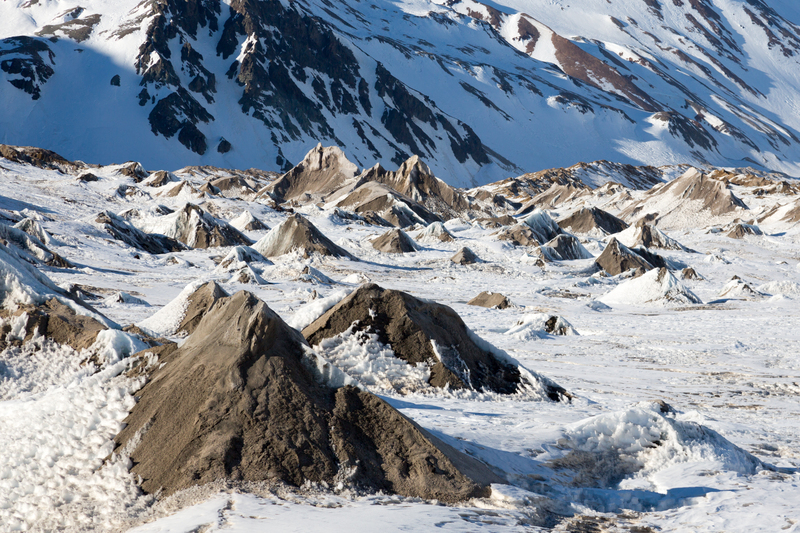 The Princess Glacier descent to Katmai Lakes was choked with ash and pumice from the Novarupta explosion (1912). 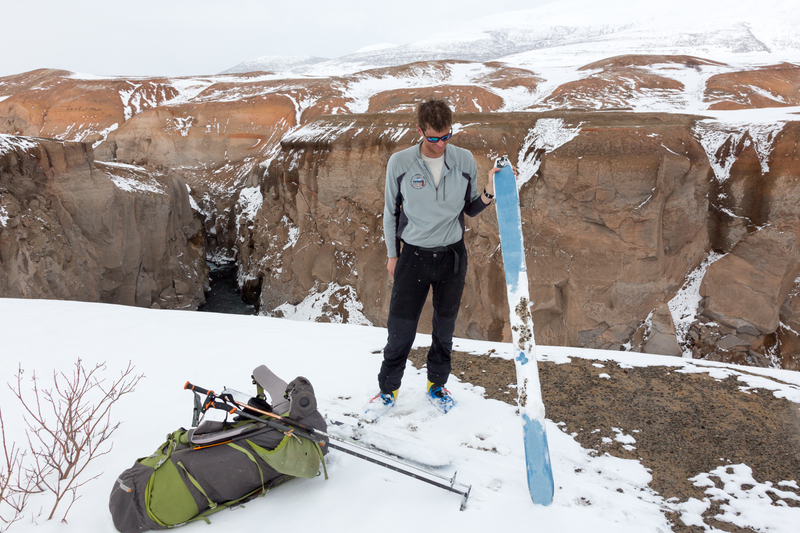 Each patch of ash and pumice stalled our skis, but the novelty of the ‘kitty-litter’ pockets outweighed frustration. 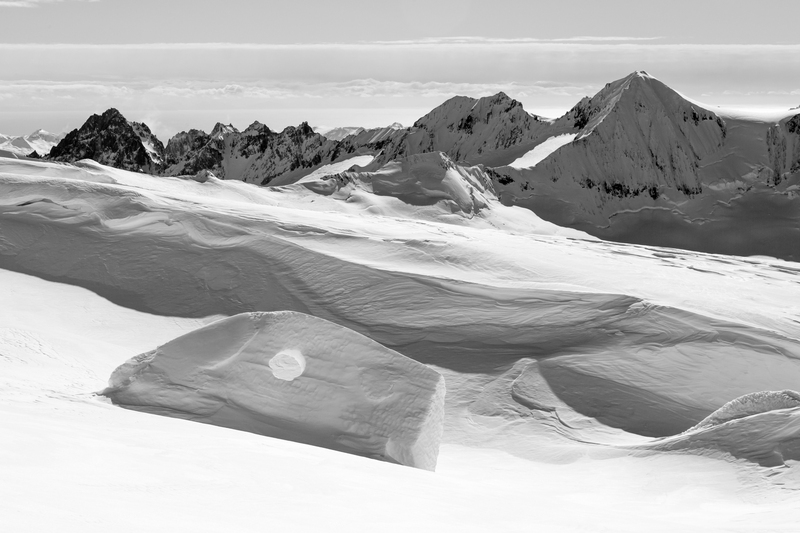 We were able to piece together enough snow to ski most of the moraine, weaving around cones of pumice. The constant tailwind gave us a boost down the river from Katmai Lakes, though it also meant a windy camp. 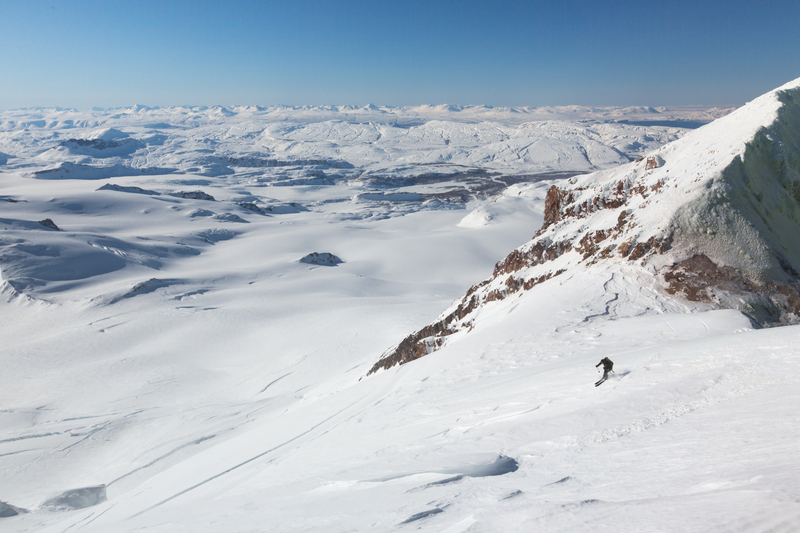 In the morning we reached the mouth of Katmai River Canyon. I was nervous about anything labelled ‘canyon’ on the topo maps, and the river had enough water (400 cfs?) that we couldn’t make easy crossings. But the canyon walls left enough room to manage the channel, and the crossings never passed thigh height. A hot springs seep on river right was an unexpected bonus. The hottest pocket of water (105 ºF?) wasn’t deep enough to sit in, but Josh and I each found deeper pockets that were warm enough for a soak and wash. This was a real treat! 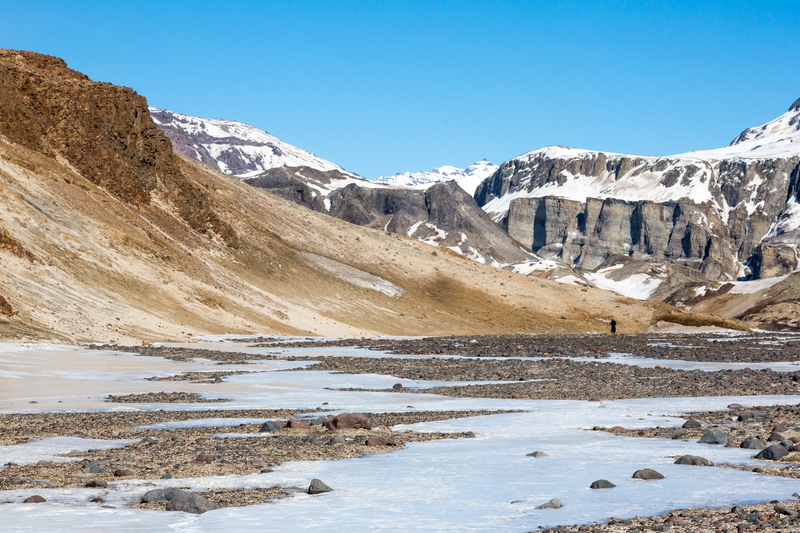 We exited Katmai River Canyon and crossed over to Mageik Creek to hike to Katmai Pass. 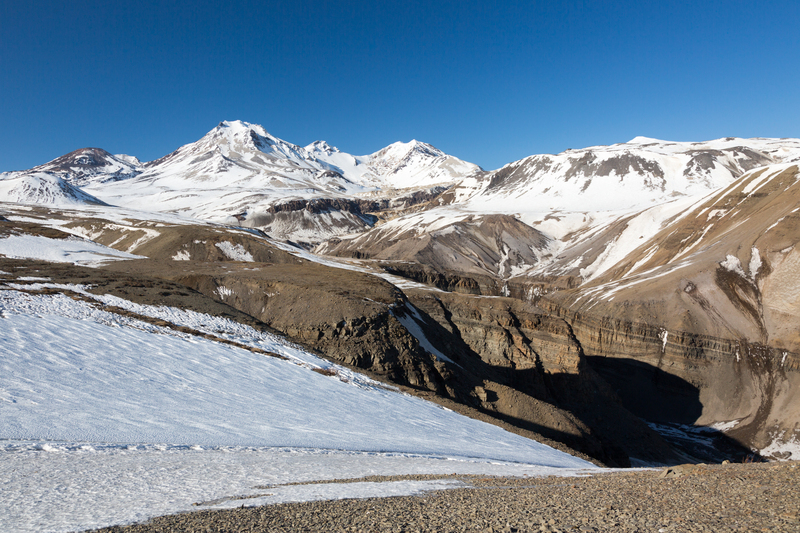 This was a traditional trade route before the Novarupta eruption. The ground was snow-free, and the views were excellent, it would be a great summer hike (or fatbike, but they aren’t allowed in the park). I liked knowing the historical context, which is rare on these traverses. All of the native Alaskans that lived in the Katmai area survived the Novarupta eruption, and they resettled in Perryville, further down the Aleutian Peninsula. Around 9 pm we stopped to discuss setting up camp. Josh had been obsessed with storm and ‘blizzard’ forecasts, which seemed unlikely under the calm wind and blue sky. We decided to push the last 4 miles to the USGS Baked Mountain hut in the dark, just in case. 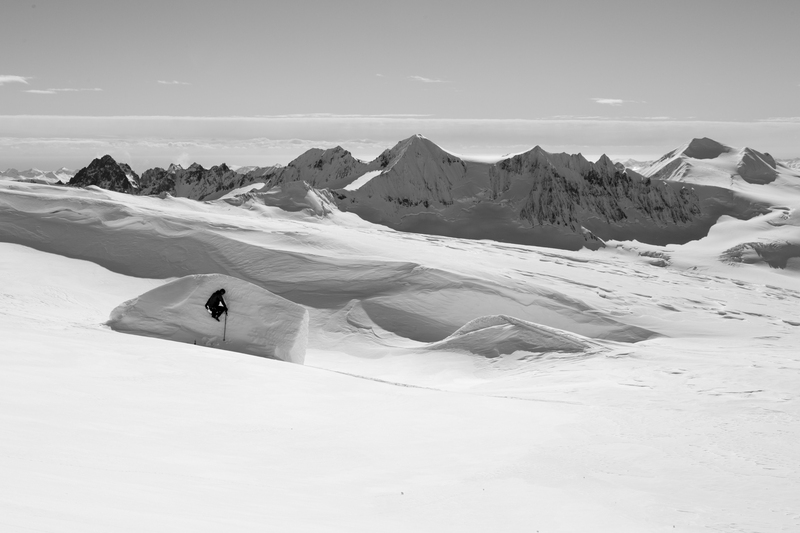 We reached the hut at midnight, shoveled the snow away from the door and tucked in for the night. 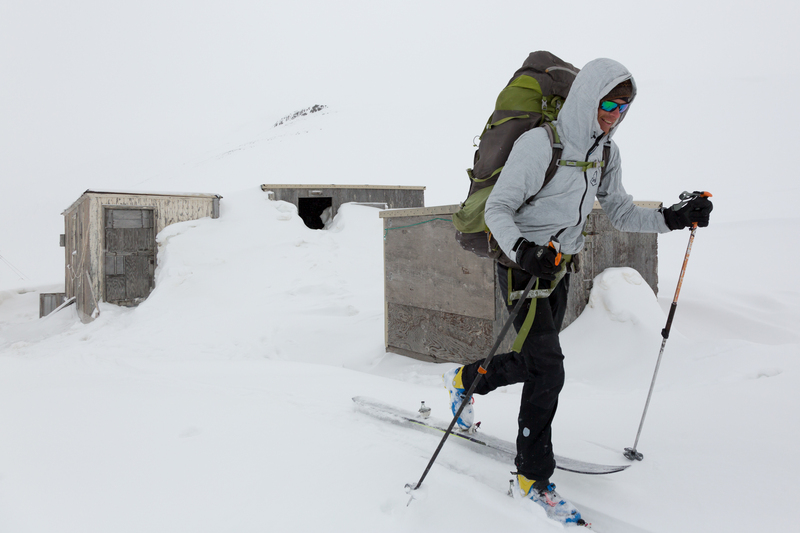 The hut was filled with drift snow and pumice, dark and dirty. 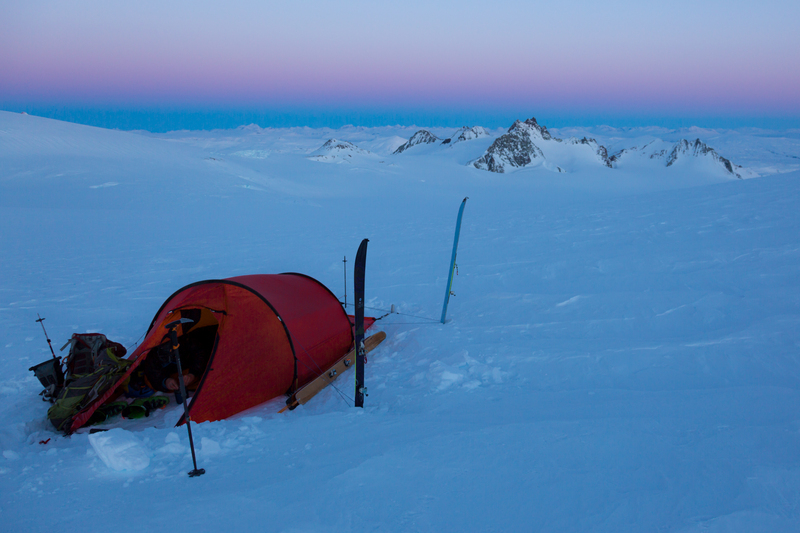 Around 3 am I woke to a shaking hut and blowing snow. I tried to wake Josh to point out that he was right about the storm, but he wouldn’t budge. 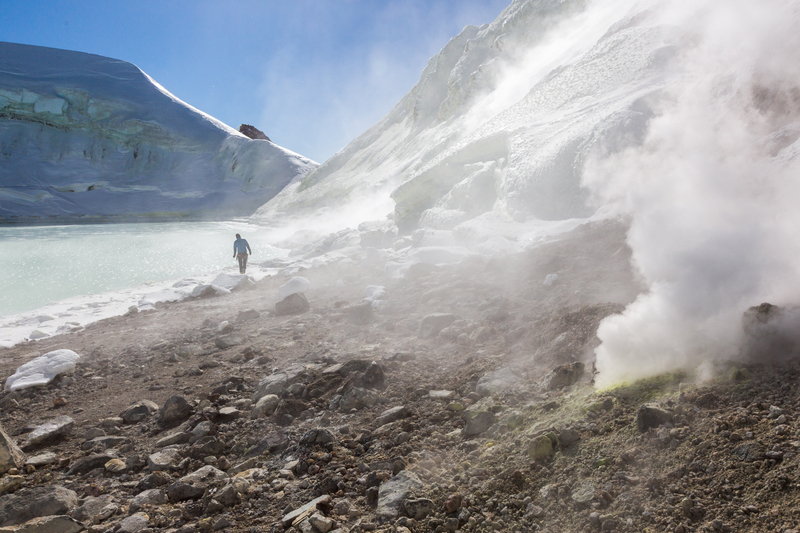 We spent two nights in the hut, only exploring as far as the Novarupta crater, which is still steaming. 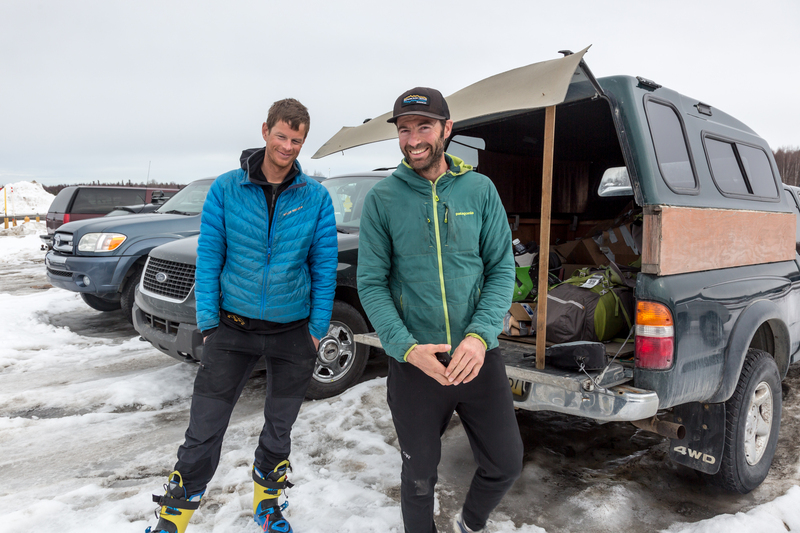 I had wanted to ski both Katmai and Griggs, but with 80 miles left to exit, unknown snow conditions, and 6 days of food, we decided to start the exit. We had several nice views of the Valley of 10,000 Smokes, and I got to scope out the Lethe River, which, based on photos online, I thought I might want to packraft in the fall. Nope! The incision was impressive, and the sections that weren’t narrow looked sievy. 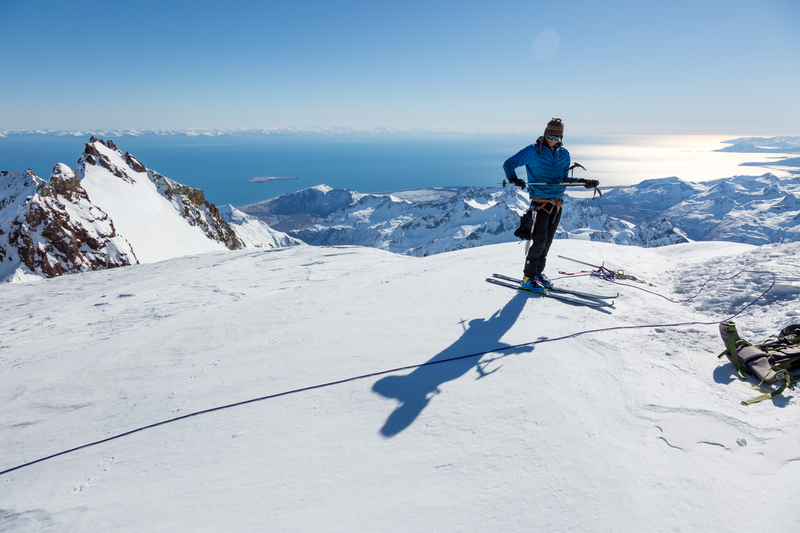 The new snow was warm and wet, ripe for sticking to our skins, and even my dry ski bases. The snow was sticky enough to pick up chunks of pumice. 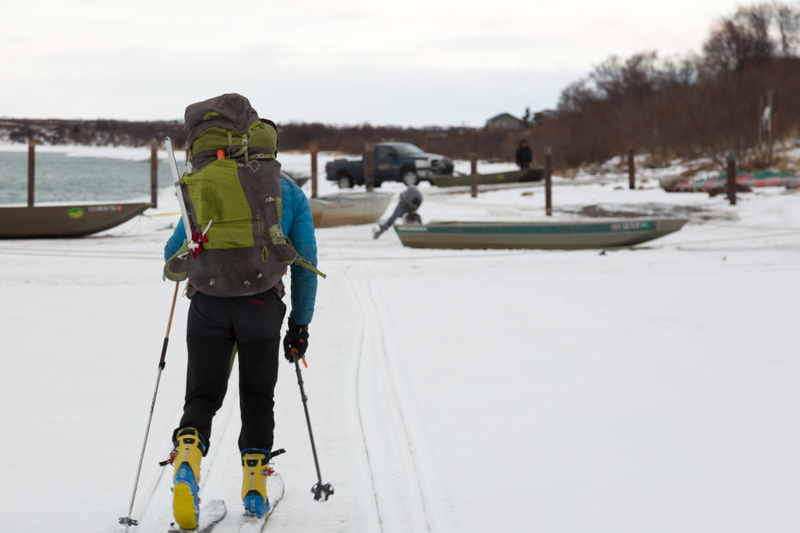 We skied the road from the Three Forks Visitor Center to Brooks Camp, and then cruised across Naknek lake with a 20-30 mph tailwind. 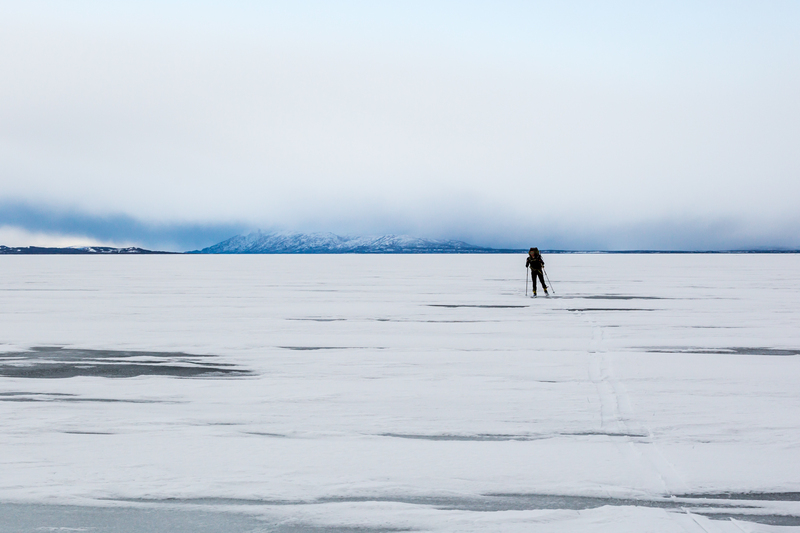 We were able to use the ice skates for a few miles, but had missed the window of skateable ice by 4 days. We reached the boat dock at 8 pm, hitched a ride with Heath and Rubin of Bear Trail Lodge, who dropped us off at Chris Klostertman’s duplex, where Kasie and Graham fed us and put us up for the night. In the morning we got coffee from the bar, breakfast burritos from the AC store, and flew back to Anchorage. Josh wore his ski boots on the plane, I wore a pair of tennis shoes I found hanging in Chris’ garage. The traverse was 200 miles and took 15 days. 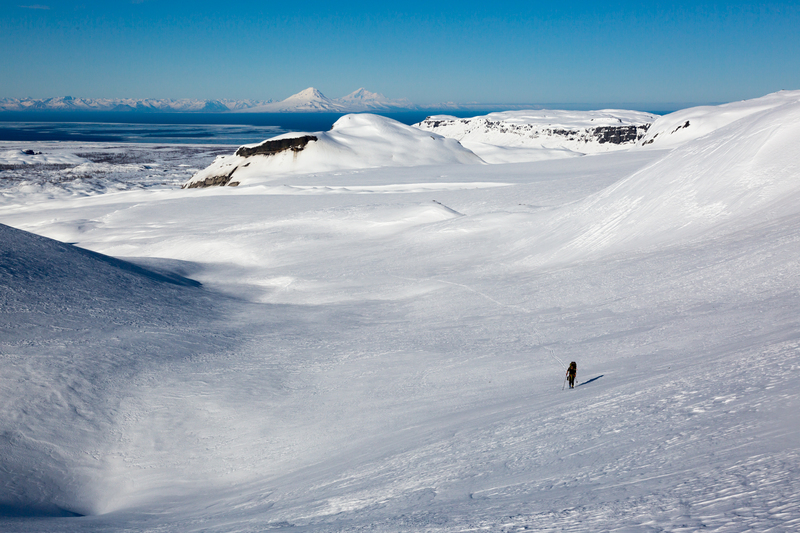 We finished a full week early thanks to the tailwind and fast travel on sastrugi. 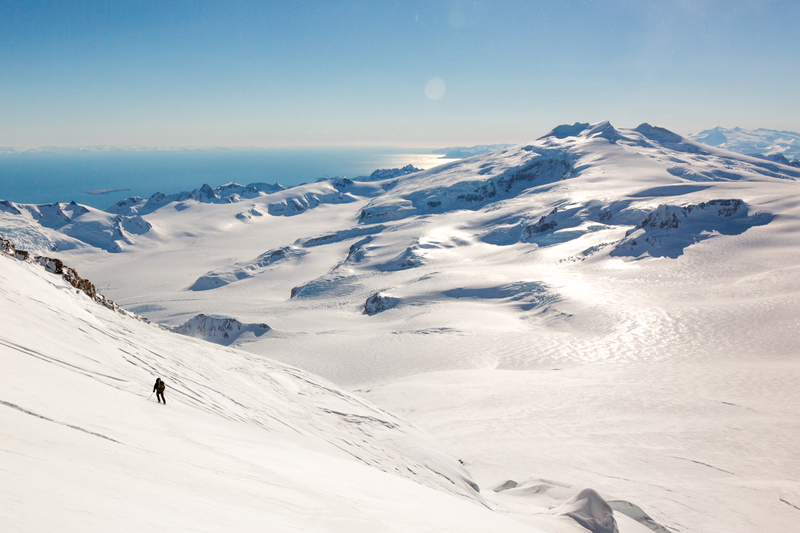 The combination of ice travel, active volcanoes, and beach time made this a world-class tour, uniquely Alaskan. In the Baked Mountain hut I read about Alaska’s resistance to the initial designation as a national monument, then park, and Sierra Club’s resistance to the Valley of 10,000 Smokes road access. I’m grateful that the Katmai area is protected and managed as a National Park, and that there is at least some sort of road access. Katmai is hard to get to, but without visitors to Alaska’s wild lands, I’m afraid there won’t be continued support to protect them. 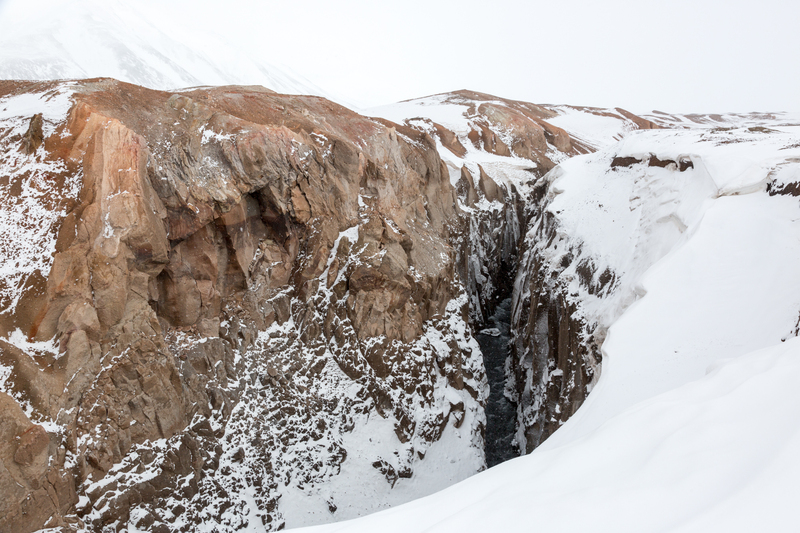 I hope these pictures convey some of the “wealth in wilderness” of Katmai National Park. Awesome trip info! Glad you guys made it, hope to visit sometime. Really good stuff. Best pic is the lenticular cloud over snowy peak. What were the dates on this trip?